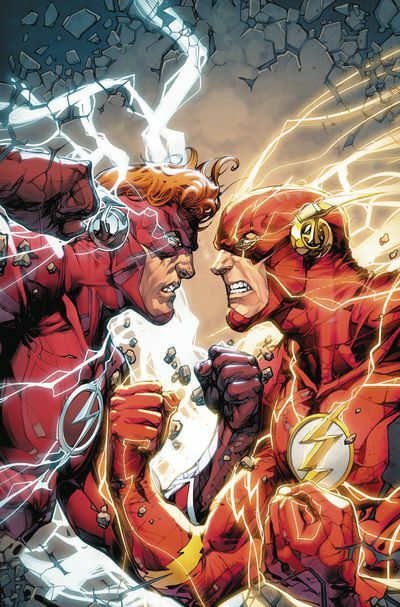 Who’s your favorite Flash: Wally West or Barry Allen? Go on, pick a side, or else one will be chosen for you during the following adventure created by Joshua Williamson, Scott Kolins, Howard Porter, and published by DC Comics. It’s June, 2018, and it’s time for a double-fast review. TO QUOTE John Webster: 'When a man's mind rides faster than his horse can gallop, they quickly both tire'. Ever since he reunited with his maiden aunt, Iris West, Wally West and his new life in Central City have slowly been spiraling out of control. How so? Well, the instant they came face to face, all of a sudden Wally's dormant memories came flooding back to him in, excuse the obvious pun, a flash, and this has caused him to hallucinate about the past and feel frustrated by the whole ordeal. So much so, in fact, that Barry has taken the initiative and made sure that Wally is examined by a number of specialists to find out what’s really going on. These include the magician, Zatanna; J'onn J'onzz, the Martian Manhunter; Green Lantern, Jessica Cruz; as well as Silas Stone, Cyborg's father. But unfortunately this all comes to no avail, as Wally only gets worse, Barry only gets more concerned, and everyone around them notices how pensive they’ve now become! None more so than Hunter Zolomon from the 25th century, otherwise known as the villain, Zoom, who just like his mentor before him, the now deceased Reverse Flash, a.k.a. 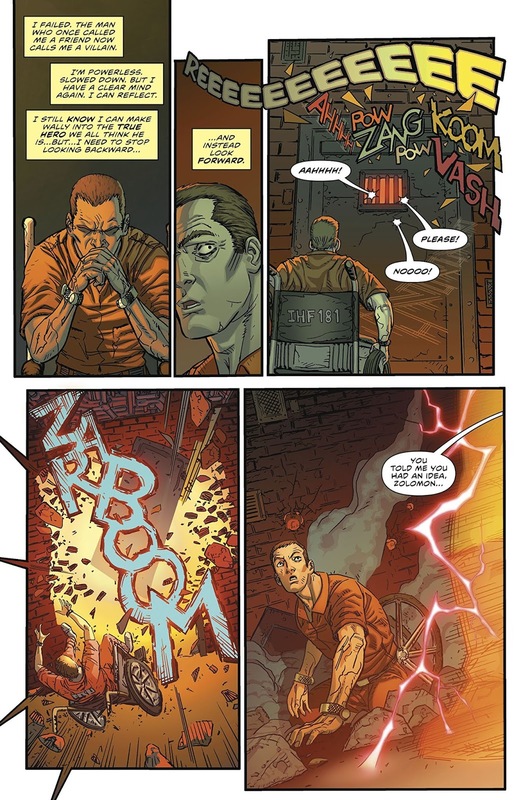 Eobard Thawne, craftily sees a way of using this situation to his advantage. 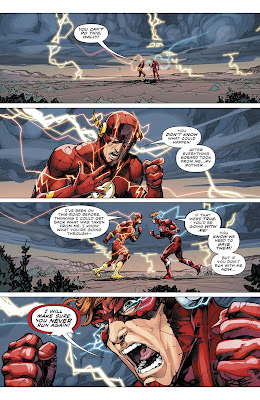 Part One) FAST FEELINGS: First off, please allow me to say how much I’m enjoying this current ‘Flash War’ storyline. Not only is it nicely illustrated and full of emotion, passion, and intrigue, but in addition to this, a large portion of the plot is dedicated to my favorite version of the Flash: Wally West. Well, to be completely honest, as much as I like Barry and think of him as being a nice, pleasant, person, with a lot of emotional and heroic ways, at the same time it’s largely due to these oversimplified qualities that urges me to prefer Wally a little bit more. While Barry’s nice, earnest, and very touchy-feely when it comes down to his personal interactions, Wally, on the other hand, is a slightly more loose person, less wholesome, and possesses a wilder side that’s fairly associative in temperament and tone. 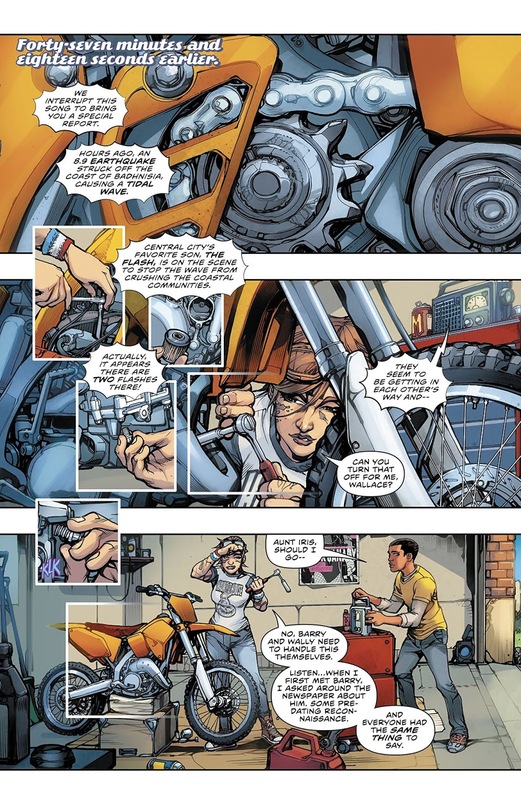 Now a good example of this can be seen in issue 46 where Wally, the poor sod, has to go through a series of tests so he can find out what’s happening to his mind. After a while, though, he starts to feel anxious about the whole situation, pensive even, and so, through sheer frustration, he gets up, takes off any wires attached to his body, and quickly runs to one of his old haunts so he can reflect on his past, present, and future. Which I can understand, up to a point, because if you’ve ever been in a situation where you’re constantly being bombarded by tests, medical examinations, plus other things of that nature, eventually you’re going to get fed-up, annoyed, and would want to get away to a place where you can relax and unwind. Trust me, I’m talking from experience here, folks, and that probably explains why I applauded Wally’s actions when he cut loose and broke free (even though the place he ran to doesn’t currently exist). Along similar lines, I have to also applaud Barry for what he did during the exact same episode. Yes, I am referring to his little trip to the Batcave; and yes, I did get a right kick out of his conversation with Alfred about Bruce hiring new sidekicks. Although, to be fair, what he said to Alfred didn’t make much sense, not completely, anyway, keeping in mind that Barry’s supposed to be a logical person and should be able to work things out in a clear and logical fashion. So, if you think about it, why would he want to criticise Bruce for taking the time to teach the younger generation the art of defending themselves, particularly since these damaged and normally broken individuals are seeking some sort of guidance and direction? Admittedly, teaching someone how to fight crime does have its obvious drawbacks, either to their health, their personality, as well as their overall lifestyle. But what would be even worse? Deliberately turning their back on someone desperately in need? Or forgetting about their plight altogether? Which, I hasten to add, is something Barry himself has never, ever, done! Not to his sidekicks, not to his work colleagues, and not to anyone else he holds dear. So this, regrettably, makes him come across as being a bit of a hypocrite and does seem slightly out of character. No offence, Barry, although I’m sure you know what I mean! Part Two) ZOOMING TO THE ZOO: Funnily enough, all of this talk about someone being a hypocrite, tut-tut-tut, brings me quite nicely onto Hunter Zolomon! 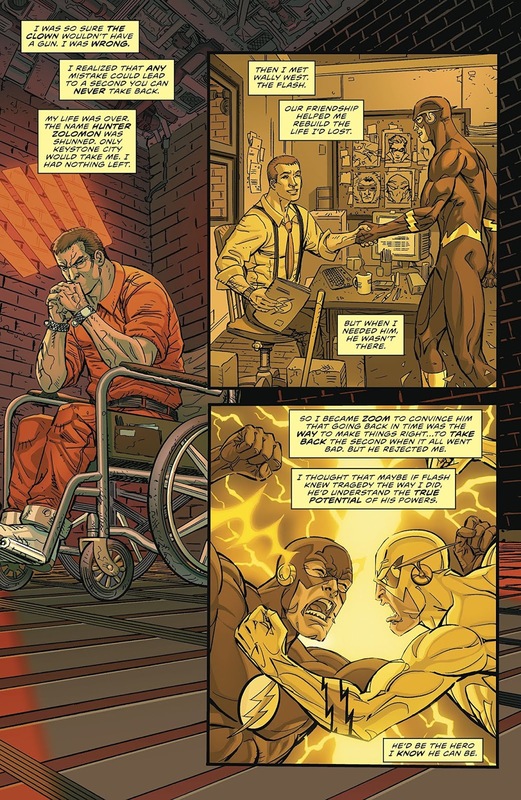 Or as this adventure would like to define him, Wally West’s own personal version of Eobard Thawne! Not that this is a bad thing, mind you. If anything, I strangely enjoyed following the similar tragedies they’ve both faced, such as the loss of a wife, being crippled during their line of work, as well as the fact that they both come from the same time and place. I also liked the fact that Hunter helped Thawne behind the scenes with his most recent battle with Barry, during the ‘Running Scarred’ saga, in a gambit where they tried to defeat their respective adversaries by using the same method. Having said that, though, the one thing I wasn’t buying into was that whole notion where you can make someone better by forcing them to face hardship, after hardship, after hardship. I mean, come on! Who can honestly believe something that stupid? I can’t, not totally, although I do acknowledge that sometimes people who face a great tragedy can build up a tolerance and a determination to push themselves further than those who don’t. But then again, occasionally the opposite can also be true, and they can regrettably break under the pressure and the strain. Come to think of it, in stark contrast to issue 46, I wasn’t that keen on the depiction of Wally’s character during issue 47 either. You see, unlike the previous episode, this one mainly focused on The Renegades traveling to the present day so they could find, apprehend, and then take back Iris West for killing the Reverse Flash. But unfortunately, due to his current condition, Wally doesn't react too well when confronted with this predicament. Instead of cordially standing up to them or attempting to take them down, Wally strangely acts like a spoilt child -- a very spoilt child who's told that he can't have something he wants -- and so he quickly picks up his Auntie (who, by the way, was a great addition to both books) and runs off with her, knowing full well that the Renegades will come after them both, along with Barry and the other Wally who were likewise by her side. Now, with some benefit of hindsight, I didn't find this sequence very realistic or engaging at all. If anything, it was very annoying, Wally's actions I mean, as they appeared completely out of character for my favorite red-headed speedster. Even though I can completely understand that he’s got a lot on his mind -- and yes, I do mean a lot -- in the same breath Wally isn’t stupid, Wally isn’t a child, and Wally isn’t totally unfamiliar with this type of situation, especially if you take into consideration any of his previous experiences as the Flash. But then again, maybe that’s part of the problem -- Wally’s previous experiences -- because I don’t think Joshua Williamson has taken this on board and that's why he doesn’t have the right handle on Wally’s personality yet. Not completely, and in some way justifies why Wally doesn’t feel authentic, natural, or anything like the man we all once knew. With a little luck, however, Josh should be able to turn everything around amidst this saga, and once again bring the Flash Family back to prominence: Wally, Bart, Max, Johnny, Barry, and Jay, along with the current incarnation! 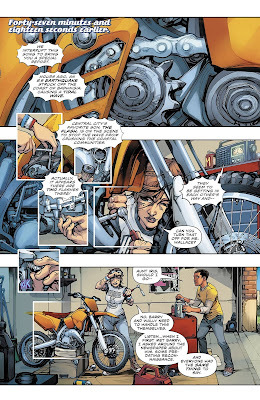 Part Three) WHO ARE YOU CALLING YELLOW: I’m happy to say that both of these issues were bright, bold, and very dynamic to look at, all thanks to the artistic talents of Scott Kolins (issue 46) and Howard Porter (issue 47). Essentially both of these artists were able to craft their respective episodes in a very clear and concise fashion, doing so without making things appear too confusing by design. Take a look at how they drew Wally West, for instance, because you can tell from the way they positioned his body, contorted his face, and placed the panels he’s featured in, that he’s a very worried man, sick in fact, almost as if he’s just walked out of a doctor's office after hearing some bad news. You can primarily see a good example of this in that scene where Wally goes to the Flash Museum and suddenly realizes it doesn’t currently exist, as well as on Wally’s face when he picks up his Aunt Iris and runs away with her. 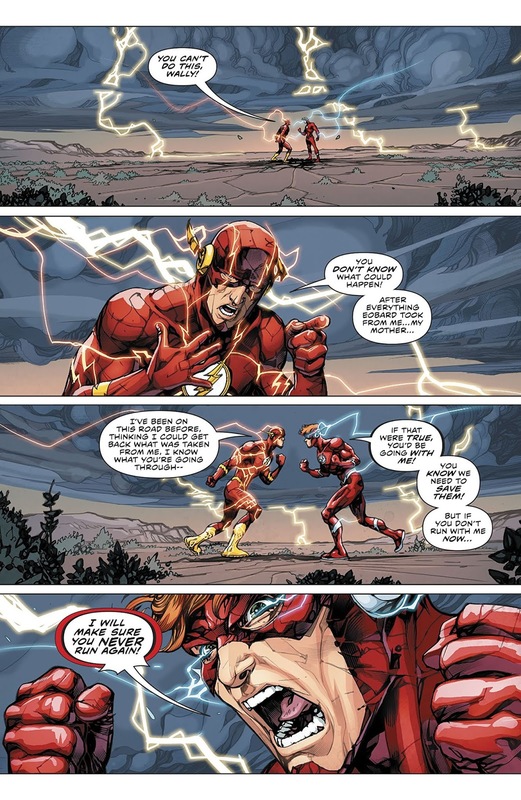 I also appreciated how they both included those flashback sequences and poignant panels referring to other stories from times past, such as when Wally joined the Justice League; that whole sequence that showcased Zoom’s origins; as well as that brief glimpse from ‘The Return Of Barry Allen’ storyline; and I say this because each and every one of these flourishes felt like a nice, special bonus, as they were able to enhance the overall adventure by giving it a warm, personal touch. That said, however, the one thing I wasn’t too thrilled about would have to be that rather long-winded action scene Howard drew in issue 47. Now my reasons for saying this is because of the color yellow — yes, I said ‘yellow’ — which is the same color that’s projected out of the Golden Guardians power ring when it’s revealed that she’s now a Yellow Lantern (i.e. a possible future member of the Sinestro Corps). From my point of view I felt there was just way too much yellow splashed on the page during this section of the story (it was oversaturated), and more or less this sequence and revelation felt fairly disposable, particularly when you take into account how this issue began and ended: Meaning, why show the aftermath of an event before it's begun? After all, doesn’t it kind of make the lead-up to said-event seem somewhat redundant in retrospect? But apart from that slight gripe, overall these two issues of The Flash were a great read and I’m honestly interested to see where things will go from here on in. 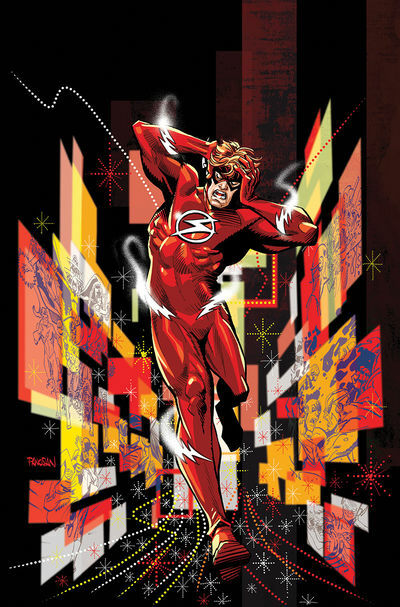 Will this be the end of Barry or will this be the reintroduction of Wally? Either way, the future is looking very interesting indeed. Now I know this may sound like an obvious cliche, but I’d like this month's musical match-up to be the Cher song, ‘If I Could Turn Back Time’, simply because that’s what a lot of the characters featured in this adventure want to do. Well, most of them do, anyway. 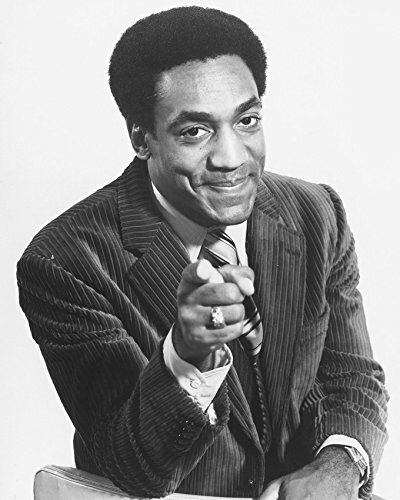 By now I’m sure you’ve seen the picture of Bill Cosby provided and are starting to wonder why I’ve chosen him to be this month's comic book comparison. Well, in simple terms, these two episodes are about a worried person with confusing memories and a guilty person going to court. So, if the jumper fits, why not wear it? Together we are going to save you some money on your next car insurance. Together we are going to go to the local karaoke bar and sing the Cher song, ‘If I could turn back time'. Together we are going to save your children. Together we are going to Ibiza. Together we are going to the nearest chemist so we can cure your flatulence. Together we are going to kill the Flash. Together we are going to watch our TV show on the CW. Together we are going to dance like its 1999.